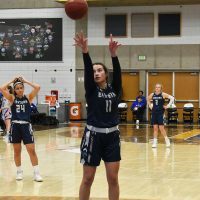 PRICE – Utah State Eastern women’s basketball lost to the Salt Lake Community College Bruins on Saturday 70-53 in Taylorsville. In the first quarter both teams went back and forth until Salt Lake built a six point lead. Led by freshman guards Amiperia Ti’a and Emmery Wagstaff, the Eagles came back and were down by three at the end of the first quarter. Wagstaff and Ti’a scored all 12 of the Eagles points and combined for six rebounds in the opening period. Salt Lake would continue to hold their lead in the second quarter and built it up to as much as ten because of turnovers by USU Eastern. The Eagles gave up six turnovers in the second quarter with Salt Lake scoring eight points off those turnovers. Despite the turnovers the Eagles were able to keep the rebounding battle close as Salt Lake lead in rebounds 19-18 in the first half. In the third quarter the Bruins went 9-14 from the field while the Eagles went 3-13. USU Eastern would shoot the ball better and give up less turnovers in the fourth quarter. The Eagles shot 46.7 from the field and 2-4 from three to outscore the Bruins 20-15 in the final period. “The team continued to battle despite our low scoring third quarter,” said Warburton. Tia finished the game as the team’s leading scorer with 14 points. Wagstaff was the Eagles leading rebounder with 9 boards. She also had 10 points and two steals against Salt Lake. The loss on Saturday puts the Eagles at 4-5 in the conference and 16-8 overall with three games left of the regular season. USU Eastern will return home on Thursday for a crucial game against Snow College. This will be the third and final regular season meeting between the Eagles and the Badgers with Snow leading the series 2-0. “Against Snow on Thursday we will need to control the rebounds, push the ball and follow the defensive scout,” said Warburton. Thursday’s game is scheduled for 5:30 p.m. inside the BDAC. Fans can purchase their tickets in advance at usueasternathletics.com/tickets. The game can be seen live on the Scenic West Digital Network at scenicwestnetwork.com.